I’ve won another award from the WPJA! It’s important to put this award into context. First of all WPJA (The Wedding Photojournalist Association) is considered an extremely good place to pick up accolades; it’s one of the top directories for award winning wedding photography… IN THE WORLD! I should also mention that this particular award won a Gold Medallion. To get Gold the image must have been selected by 100% (all 4) of the judges which is a huge achievement – in-fact only 15 photos in this collection made Gold which puts me into a tiny fraction of the overall images submitted. The WPJA must like it a lot, they’ve put it on their homepage! 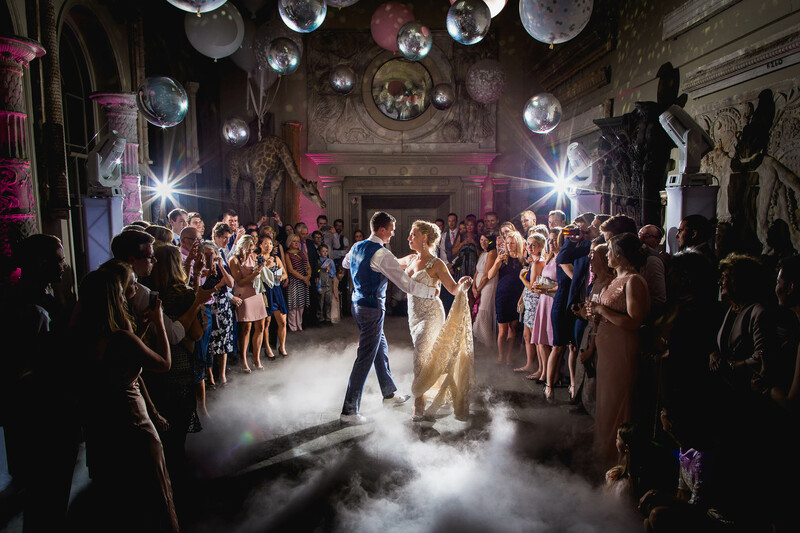 This picture was taken during Chloe & Joe’s first dance at the exquisite Aynhoe Park in Oxfordshire. Aynhoe Park is a Grade I listed country house that was rebuilt after the English Civil War. The current owner has pretty extraordinary taste and has decorated the interior with everything from rare works of arts to a polar bear (and if you look close enough in my picture you’ll also see a giraffe). I’ve had the privilege of working at many wedding venues throughout Europe, many have provided the happy couple and guests exceptional service, but Aynhoe is a step even above that. To date, the best wedding venue I have ever had the honour of working at. A big claim, but it’s all true. One of the first things I did when I got back to my studio was check future bookings – I’m back in 2019 to get my fix of Aynhoe 🙂 A huge thanks to Cleo & Mark – the Rolls-Royce of wedding planners. Documenting for Chloe & Joe was a pleasure from start to end, and opportunities (like the one in this award winning photo) only happen when the couple are relaxed and in the moment. It was a collaboration and the result of heaps of hard from from the couple, lighting expert, DJ and of course the venue itself. Chloe is a warm caring woman, somebody that I instantly clicked with the first time we chatted on Skype. Her vision for the big day was an all out celebration of love – and she achieved her goal in style! And Joe, what can I say about this extraordinary man; I’m so happy that he got to meet and marry his soul mate. Good things happen to good people, and I am forever grateful that I got to spend the day with these two wonderful people and their friends/family. At the time of writing this, Chloe & Joe have also won a whopping 7 MyWed Editor’s Choice Commendations too. Check out more of my awards, features and achievements here. And as connections work; it turned out that I had also documented for Chloe’s friends last year: Jane & Jon at Brookfield Barn (also a gorgeous couple!) – Everything in the universe is linked. My my. I had to double-take because I actually thought this looked like a painting at first. I'm not surprised this won an award, stunning work Aaron. The execution in this shot is just insane! So well done. I didn't even notice the giraffe first of all! Award well deserved.